The work I encounter for this project continues to fascinate me. It also continues to deepen and expand my understanding and appreciation of the Bible, the world in which its events are situated, and the political climate that dictated how its content would ultimately be shaped. 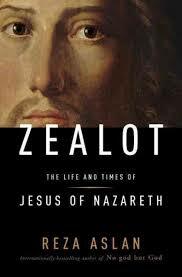 Aslan’s Zealot: The Life and Times of Jesus of Nazareth provides an interesting, informative examination of Jesus as well as a few key players in the early Church. As I mentioned, I had expected a book that investigated Jesus and determined that he was not the man that the Bible portrays. Instead, this book handles these important figures with respect, and in his discussion, Aslan seeks not to destroy but rather to untangle much of the content that the New Testament has skewed. In so doing, he is able to re-contextualize it, which provides a clearer picture of the faith people are following. Predictably, Aslan doesn’t bother addressing any of the supposed gay content in the Bible. Why would he? Even though the Bible surfaces in mainstream discussions about homosexuality more than any other conversation, Jesus never mentioned homosexuality. But Paul, on the other hand, says a lot about homosexuality—particularly in Romans. And even when discussing him, Aslan never touches homosexuality. Instead, he focuses on what’s important. Do I think that this means Aslan has no opinion on homosexuality? I have no idea, but by focusing on what he does, Aslan by extension asks people to focus on what matters too. Too often, people are focusing on a minute detail by devoting so much energy to homosexuality. This turns the “issue” into something bigger than the Bible does. So why should we? Furthermore, we should consider the source. As Aslan’s chapter devoted to Paul demonstrates, we should take a moment to think long and hard about the authority to whom we have granted a major say in our society’s thoughts on homosexuality. To say that the Bible says homosexuality is wrong is accurate. Yes, it’s in there. But if the source within this book was discredited by the very organization/movement he professed to represent, why then are we taking his word for things? We can’t turn back time and interrogate Paul. Why then don’t we bother relying on the people who could? To disregard what they believed over Paul seems problematic, and not just on the gay issue. What else might he be mis-representing? It seems clear that if Jesus actually met Paul—as opposed to supposedly visiting with him in the spirit form—it seems clear that he would have set him straight. My journey on this blog continues in May, as I discuss a book I found called The Year of Living Biblically, by AJ Jacobs. My sense is that it’s a somewhat humorous take on what happens when a person tries to follow the Bible literally. I don’t know what if anything it will add to this project, but I’m going to read it with an open mind. This entry was posted in Aslan's Zealot and tagged Aslan's Zealot: The Life and Times of Jesus of Nazareth, Bible, Bible and homosexuality, Brad Windhauser, New Testament, Paul. Bookmark the permalink. It is correct that Jesus never mentioned homosexuality, but then He never mentioned freebasing cocaine either. Ah, I see your logic. Being gay equals using drugs. Makes sense. Thanks for the informed comment, Alan. That’s cute, Brad, real cute. But you very (not so) cleverly side-stepped the point. When are you going to read the book of a theologian who is also a believer? My guess: never. You are only going to continue bringing to the fore the books of those who share your bias. Alan, as it turns out your guess is wrong–given your inability to understand logic independent of your faith, this is not surprising. First, I read God’s Secretaries, which is written by an academic who is a fan of the King James Bible (if the content is any indication); Ditto for Who Wrote the Gospels?, a book (if you took the time to read my posts which you take the time to comment on) written to delve deeper into authorship for the purposes of deeper understanding, not to challenge the Bible (which your comment suggests I’m doing). Most glaringly, I read the whole Bible, which is more than I can say for a lot of people, especially those on “your side.” The massive point YOU keep missing is that my issue is not with this ancient text; rather, it’s with people who use this ancient, inconsistent text to legislate their beliefs over everyone, regardless of the beliefs of others. This is most detrimental to my LGBT community. Therefore, I’m not side-stepping your point. One of the many problems with the sources you use to supplement your understanding of the Bible–that sad creationist website you passed on, which contains the rather unfortunate attempt at logic to dispel evolution (I’m referring to it’s attempt at what the population would look like if evolution were true), for example–is that you attempt to use a distorted logic to justify what you and so many others believe. If you understood truly what it means to believe, you would understand that beliefs operate independent of logic–they can’t be proven; otherwise, they would be facts, not beliefs. Are people entitled to believe whatever they choose, especially if it makes them better people? ABSOLUTELY, AND THE BIBLE CONTAINS A LOT OF USEFUL CONTENT TO HELP THESE PEOPLE. That said, what you continually choose to ignore is that the problem with beliefs is that when people pass these ideas off as facts to the detriment of others (such as the LGBT community), you act against the very book of which you are such a fan. Your offensive comparison about Jesus never coming out against drug use doesn’t mean we shouldn’t be against drugs is so ridiculous it almost doesn’t warrant a response, especially when it’s made by an individual with an M.D. after his name. But since you did, I’ll court the remark again and try and explain it to you in a way that makes sense to someone as closed minded as you appear to be: Yes, Jesus never mentioned avoiding drugs (or specially cocaine), but we don’t legislate against drugs based on what Jesus said or didn’t say: we do it because of the damage drugs do to the body, to communities, etc. This is scientific. In contrast, people legislate against the LGBT community based on what what is SUPPOSEDLY IMPLIED by Jesus in a book NOT WRITTEN BY THE MAN. That’s what you and others simply are unwilling to understand–you’re so committed to your bigotry that you fail to grasp this. As far as outside texts, I’m inundated with anti-gay rhetoric all the time. I don’t need more of it. Our society needs more of what I’m doing in order to counter all the poison spewed in our society against my community in the form of these atrocious anti-gay “religious freedom” laws. That’s what Jesus would do. If you don’t agree, perhaps you should re-read the New Testament. Brad, thanx for replying to my comments. I appreciate your taking time to do that. I want you to know that I am a retired psychiatrist. My brother who was gay died of AIDS at the age of 30. A colleague of mine, who was gay, was on the task force that got homosexuality removed from the A.P.A.’s DSM II. When I was in practice I performed the required psychiatric evaluations for transgendered people to get sexual reassignment surgery. Over the years I treated many homosexual patients with depression, schizophrenia, bipolar disorder, etc. without ever taking issue with them about their homosexuality. The point of scripture is that the only sin for which anyone is condemned for is not trusting the Lord Jesus Christ for salvation. John 3:16, 36; 16:8-11. If that makes me a bigot, then, so be it.